Four years after the release of the highly acclaimed "...was wird bleiben?" CD, Traum'er Leben come up with their new album "Winterstarre". 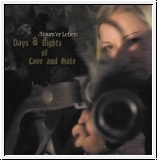 The album is split in two CDs and the complementing album "Days & Nights Of Love And Hate" containing 16 additional tracks and coverversions..
Diesen Artikel haben wir am Dienstag, 14. März 2017 in unseren Katalog aufgenommen.